Formulated without soap and enriched with soothing white clay, Cattier Organic Soap with Mint & Grenade produces a soft and creamy foam that gently cleanses and respects the skin’s natural pH. With its captivating rich and fruity summer scent, Cattier Cleansing Gel for Hands transports you to the heart of a sunny orchard ! 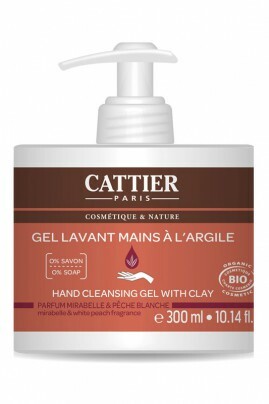 Cattier Organic Hand Cleansing Gel Peach & Mirabelle Plum smells so good ! Clean composition with 0% of soap !